Meet at the car park on Long Causeway opposite the windfarm 10.30am. We will walk down the packhorse track to view the remains of the limestone industry which began in the 16th century. On the walk we will see the evidence of this industry – the hushings, the kilns, the waste, kiln debris and heat-reddened stone. 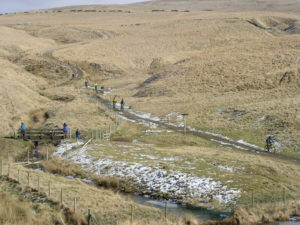 We will then cross the ford and follow the track to the packhorse bridge. 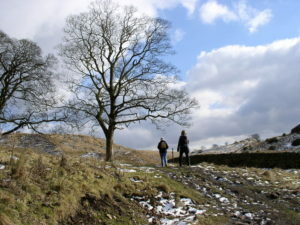 From there we will walk to Hurstwood reservoir, passing interesting earthworks along the way. If the weather is wet, a shorter version of the walk will take place. Dress appropriately for whatever the weather might throw at us, its fairly open and may be wet. Stout footwear. Packed lunch and warm drink. Banner Heading: Packhorse Bridge, Shedden. Attribution: Catherine Rousseau Jones.